Anyway, that Thursday evening trip left us with all of Friday to “play,” which was the whole idea. “Monkey” is David “Monkey-Boy” Hathaway, of course – and John Barresi and I would stay the weekend with the Monk… And so we spent all of Friday in Monkey’s company, and had a truly delightful time. To start our Friday, we hit “The Elbow Room” for breakfast… Dunno if you’ve ever heard of it or not, but their motto is “Food and service is our name. ABUSE is our game (so have some FUN! )” Well, the Elbow Room has both excellent food, and an abnormal helping of free attitude! Eggs and Hash Browns were scrumptious and the repartee got a bit rare at times. Altogether a delightful experience! So, we’re out there playing on Ray Bethell’s “home patch,” though Ray was nowhere in evidence. Barresi pulls out his Rev 1.5 and starts through his flight repertoire, and Monkey digs out his own Rev 1.5 and begins playing with the wind a bit himself. Next thing you know, those two are off flying “pairs” in their own private never-never land… Into that “groove” you sometimes get where it’s all working just right, and satisfied grins begin workin’ your jaws a bit… It was definitely FUN time on the old kite patch. 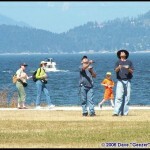 And I get called on to run the camcorder and get some video of the whole thing. That lasts for a while, roughly 30 minutes, until the battery in the camera runs dry. Oops… Someone forgot to top off the charge on this puppy! We’re not at Vanier Park for ten minutes though before our first visitor shows up. 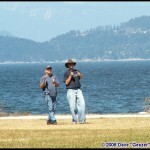 Cal Yuen is truly one of the “old timers” in British Columbia kiting, and has been a force in this community for years. 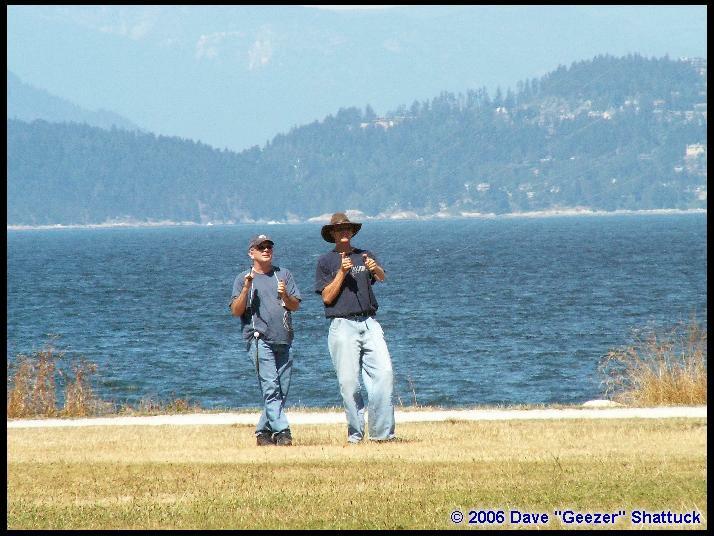 I know Cal to be an excellent dualie and quad-line pilot, a talented kite designer and builder, and a gracious festival attendee at various kiting fests and comps up and down the whole west coast. You’d think this would make Cal one of those “old fogeys” hanging on around on the fringes of the kiting community, but don’t you believe it. Cal is still a NWSKL force, both as an organizer and as a pilot, and I’m not sure he’s even 50 years young, yet. And he’d just stopped by to see if anyone was flying today and to say “Hi!” We all shared a warm handshake and a grin, and then Cal was off to get the PA speakers for tomorrow’s competition! He was out there meeting and greeting, for roughly 15 minutes. Cal is one of those genuine NICE people in kiting, and how very gracious of him to stop by to greet us this way! 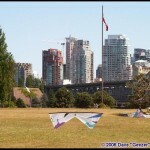 compass points, with businesses and condominiums and the British Columbia Museum and a Maritime Museum as park neighbors. 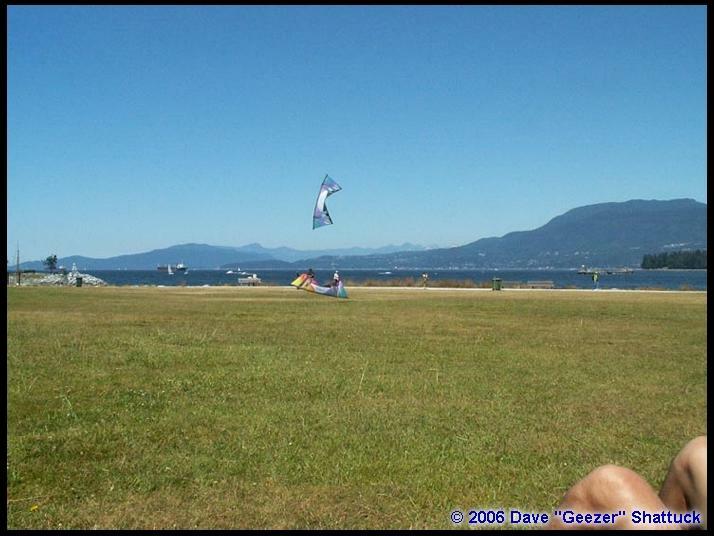 And if there’s a decent breeze anywhere in the area, Vanier Park will likely get its fair share of it. Soon enough, I’m called upon to go back to the car for water. Hydration is a problem in conditions like these, and Sir Barresi had worked up a healthy sweat, with its corresponding thirst. Not to worry, though – we had bottled water in the car. Only problem was, the parking lot was a hefty distance away, and the sun was really bearing down by now. Trek the quarter mile round trip to the car and back. Deliver water. Huddle beneath those motley pines, grabbing what shade they offered. Relax and cool down a bit. John grabs a bottle of water, and decides to switch over to his Sea Devil light. 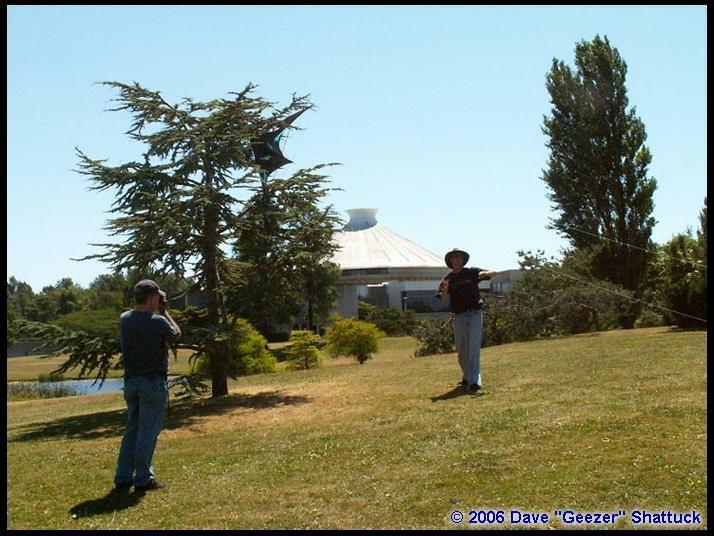 And yours truly was left hanging around with not much to do, and not awfully concerned about it either… A “warmish” but very pleasant day, a digital camera hung on my right hip just in case something happened by to shoot, and I had plenty of leisure time. And Vanier Park is an especially nice place to spend an afternoon lolling around doing absolutely nothing, which suited me just fine. Things could be a LOT worse! About 20 minutes later, John manages to get “tricky” with his Sea Devil – not that he’d not been doing tricks before, of course. This time however, it just happened to be the “Charly Brown” kind of trickery… We’re all so used to dealing with John as “The Master” that it’s always a bit of a surprise when he exhibits his mere mortality by parking his favorite Sea Devil in a 10’ pine tree. Not only parking, but really snarling it up there in the tree, too. After Monkey and I took our time and some pains to document John’s fallibility, Monkey climbed up the pine and un-snagged the Sea Devil’s bridle – with the end result being Monkey, Sea Devil, and the tree all ending up unharmed. Good show, David! Well shucks – it must be about “break time” again. So we all go back to the center of the field and huddle beneath those ugly pines and drink water and hoard shade and un-perspire a bit. 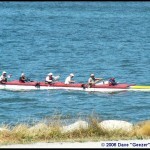 Never mind “Warm” – it was getting darned “Hot” out there! (We later learned it was already into those triple digit numbers I mentioned earlier.) John now decided that discretion was perhaps the better part of valor, and chose to put the Sea Devil down and pick up his vented Rev 1.5 again. It turned out to be a wise choice. 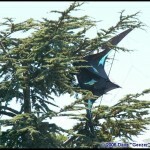 With both John and David flying vented 1.5s, they could practice their routines a bit more and compare a few notes. 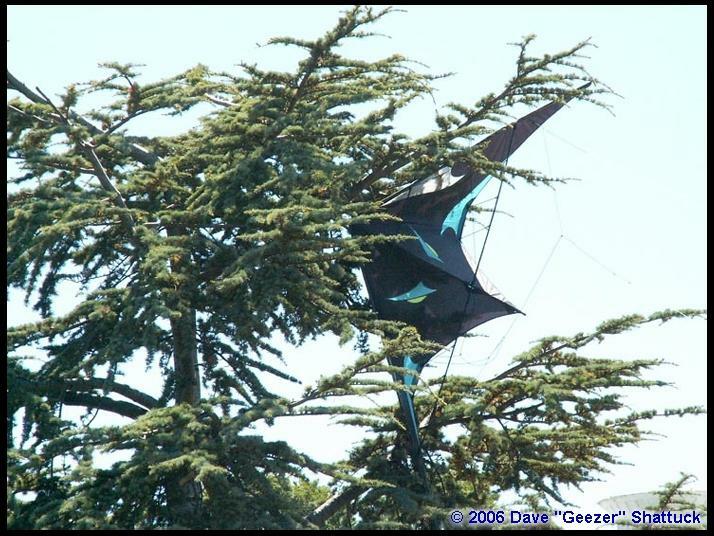 And, they could also be done with kite-eating trees for the day. Good thinking, guys! And then, all of a sudden the field started to get busy. 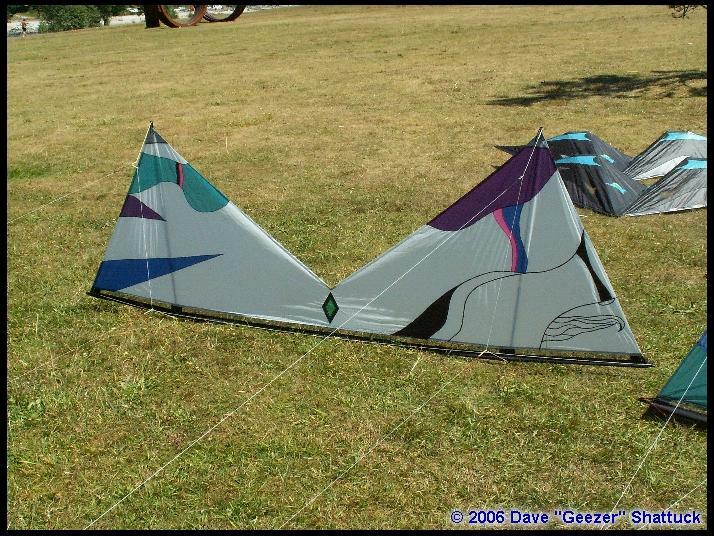 I think the first new arrival was a fellow who introduced himself as “Team Ted,” who would eventually fly a pair of Joel Scholz “Jaws” kites on separate handles. At the beginning however, he quickly discovered that he’d busted a stand-off connector and didn’t have a replacement part with him. Okay – Trek back to the car for the spare parts kit. And back out to the field again. WHEW, it’s HOT out here! But I have a connector for Ted and he’s a happy flier… He’s soon flying pairs all by himself and doing an amazing job of it. By the time I return, another pilot has joined the activities. Gerald Thompson is a mid-to-late 30s “dualie” pilot flying various stunters – one of which I believe is a Deep Space, but I could be wrong there. Lots of enthusiasm, and decent skills, so Gerald fit right in – and it turns out that both Gerald and Ted Sayko (Team Ted) fly at Vanier regularly, right along with Dave Hathaway (our friend Monkey-Boy) and Egan Davis! And lo and behold – here comes Egan now, complete with 3-4 kites tucked under his arm, plus a fistful of lines, and his normal huge, red-faced grin! What a delight it is to see Egan again! 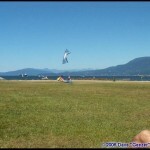 He’s truly one of the premier pilots in any kiting scenario I could ever imagine. So now we have three Rev pilots (Barresi, Monkey and Egan) and two dualie guys (Gerald and “Team Ted”) all flying around me – giving space easily and taking it back when they can, flying their hearts out, and simply stopping for a quick break and a chat whenever they felt like it! 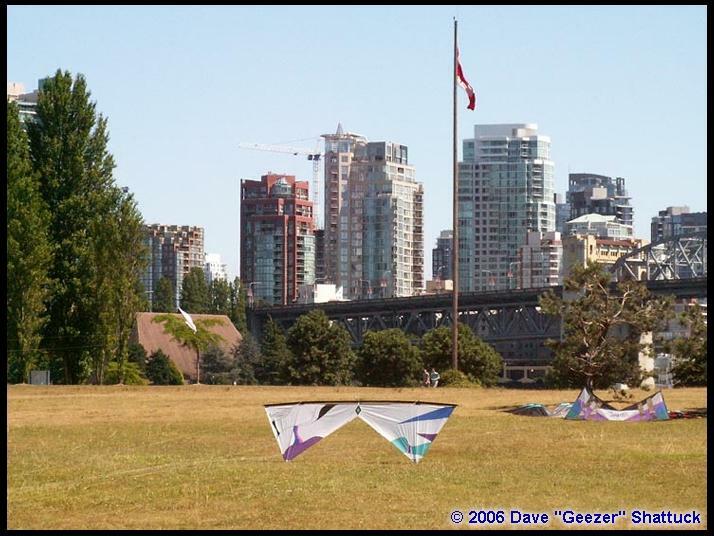 And it’s all happening in the middle of downtown Vancouver on one of the most picturesque (and probably the HOTTEST) kite fields I’ve ever been on! Yes, there were even a few other kiters who tried (and mostly failed) to put a kite up, but those five held the center of the field, and much of the attention of the passers-by. 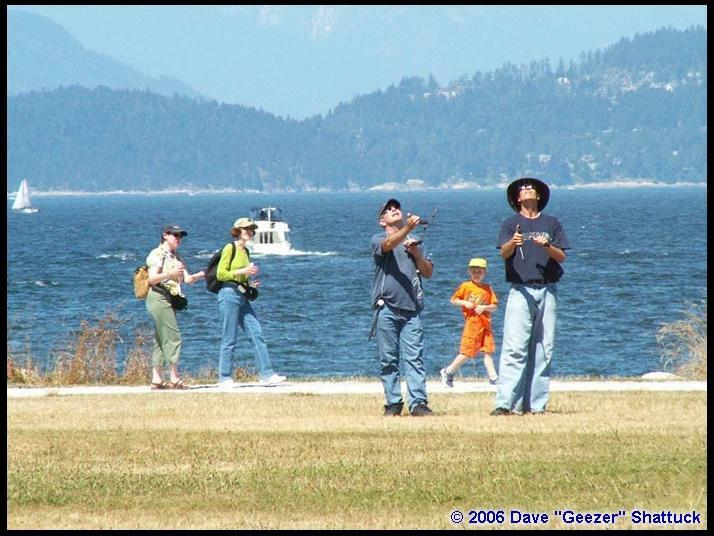 And there were plenty of those casual observers, too, but I had to note that nobody got very excited about seeing these pilots… Somehow, the local populace seems to understand and believe that Ray Bethell is still the ultimate “class” of Vanier Park! Well, Team Ted put on a “pairs” show or two. So Barresi did a few Rev stunts of his own. 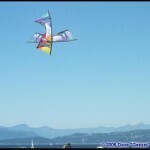 Then the three Rev pilots began to fly “team” together – which they do anyway at fests and comps around the Northwest. Gerald kept on working on his stunts – and I sat there, simply mesmerized by the extraordinary quality and class of the flying around me, and sweated my little heart out due to the heat! At this point, we’re still talking about 1-3 MPH and directions varying by as much as 120 degrees on the compass at times. Yeah – I meant it when I said “light and variable.” Alas, I’m mostly a single-line guy now, and none of my kites would have gotten onto the air with that low a wind-speed. And that’s assuming I had any interest in going back to the car and dragging some of them out to begin with. 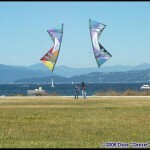 Nah… there was just too much fun going on around me for me to want to start my own kiting party. Barresi and Egan Davis would switch off between their Revs and dualies, but everyone else pretty much stuck with whatever they were flying. And that’s the way it continued for what was left of the afternoon and on into the evening. 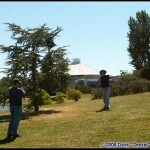 John, David and I had all been wondering, off and on, where the “rest” of our party was. While John and I had come north the previous evening, Theresa Norelius and Amy Doran were also going to meet us at Vanier Park today. 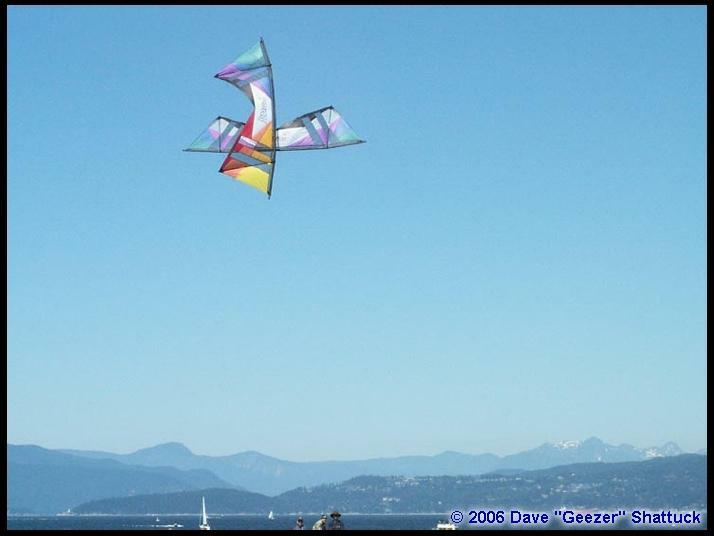 Amy is one of the bright young stars of the Northwest Sport Kite League (NWSKL), and she would drive north from her home in Bend, Oregon to meet up with Theresa in Vancouver, Washington, and together they would drive on up to Vancouver, British Columbia. While we’d been wondering where they were, one of “the girls” called on her cell phone to advise us that they’d be along shortly. Monkey (our “local” expert) advised us that their “Shortly” would probably be more like “Eventually” due to the Vancouver rush-hour traffic on Friday night – which turned out to be very true! 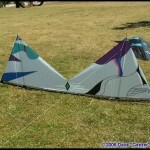 But “the girls” finally arrived, just as the sun was headed for the horizon and all the kites were getting packed away! Good to see the ladies show up, though we certainly sympathized with their traffic difficulties. After saying our goodbyes to our new-found friends Ted and Gerald, six of us headed over to a local Indian Restaurant for some camaraderie and a bowl of curry. Somehow the day’s hydration difficulties got solved – mostly with water, but also with a yogurt concoction that tasted delightful and seemed to take the brunt of our thirst away. So we all ordered some curry dish (mine was a chicken curry) and we really loaded up on the chow. Very tired, hot, sweaty, but well-fed and hydro-satiated, we all finally headed out for our various sleeping places. 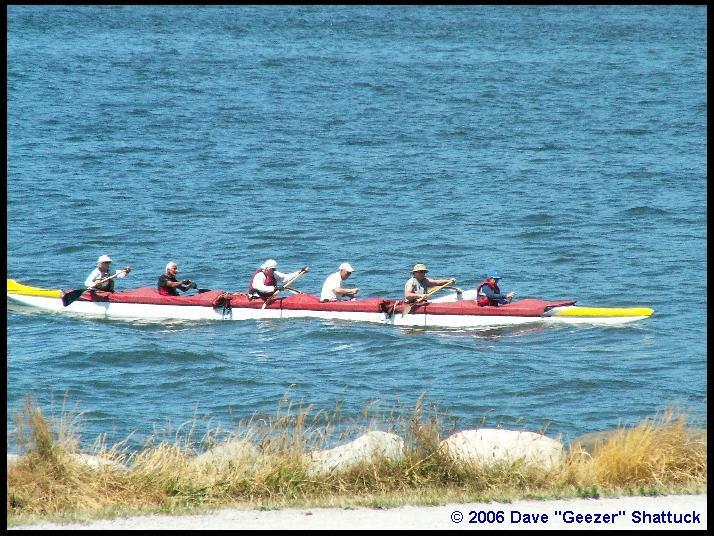 What an extraordinary day this one had been, but tomorrow we’d be down in Steveston for the comps – which was the main reason we’d all come north in the first place! 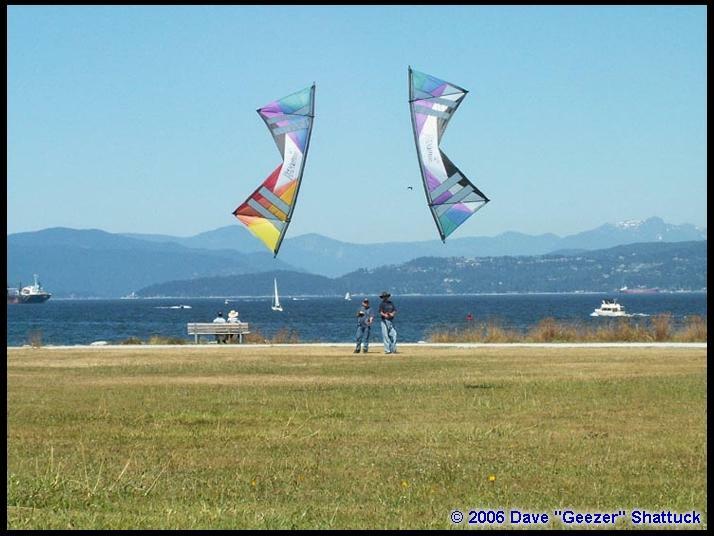 This entry was posted in 2006, Issue 49 (Jul/Aug), Kiting Experience, KL Archive and tagged A Day at Vanier, canada, vancouver.